The Web Services module allows eXo technology to integrate with external products and services. It is implementation of API for RESTful Web Services with extensions, Servlet and cross-domain AJAX web-frameworks and JavaBean-JSON transformer. Instructions on how to overwrite the default providers in the eXo JAX-RS implementation. Instructions on how to get the list of services in the HTML and JSON formats. Instructions on how to use Groovy scripts as REST services via the main content, such as loading script and saving it in JCR, instantiation, deploying newly created class as RESTful service, script lifecycle management, getting node UUID example, and Groovy script restrictions. 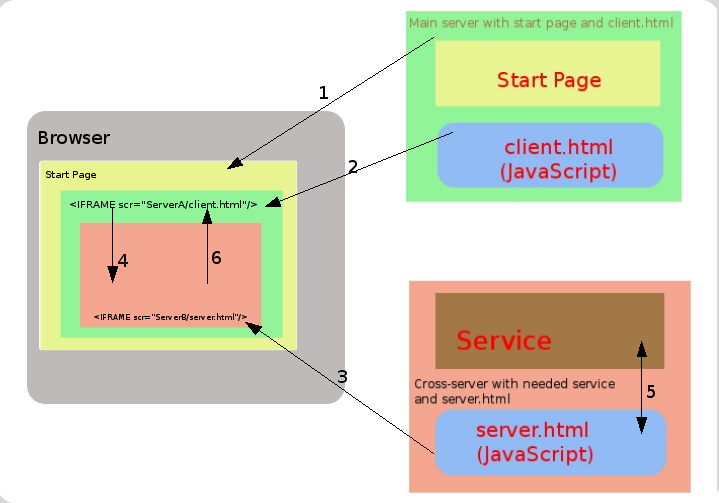 Instructions on how to use a framework to cross-domain AJAX provided by eXo Web Services. Representational State Transfer (REST) is a style of software architecture for distributed hypermedia systems, such as World Wide Web. The term was introduced in the doctoral dissertation in 2000 by Roy Fielding, one of the principal authors of the Hypertext Transfer Protocol (HTTP) specification, and has come into widespread use in the networking community. REST strictly refers to a collection of network architecture principles that outline how resources are defined and addressed. The term is often used in a looser sense to describe any simple interface that transmits domain-specific data over HTTP without an additional messaging layer, such as SOAP or session tracking via HTTP cookies. REST uses a ``resource identifier ``to identify the particular resource involved in an interaction between components. REST connectors provide a generic interface for accessing and manipulating the value set of a resource, regardless of how the membership function is defined or the type of software that is handling the request. URL or URN are the examples of a resource identifier. consists of data, metadata describing the data, and, on occasion, metadata to describe the metadata (usually for the purpose of verifying message integrity). Metadata are in the form of name-value pairs, where the name corresponds to a standard that defines the value’s structure and semantics. The data format of a representation is known as a media type. REST uses various connector types to encapsulate the activities of accessing resources and transferring resource representations. The connectors present an abstract interface for component communication, enhancing simplicity by providing a complete separation of concepts and hiding the underlying implementation of resources and communication mechanisms. The primary connector types are client and server. The essential difference between the two is that a client initiates communication by making a request, whereas a server listens to connections and responds to requests to supply access to its services. A component may include both client and server connectors. DELETE to DELETE or CUT. The RESTful architecture is not limited to those methods, one good example of extension is the WebDAV protocol. The CRUD (Create, Read, Update and Delete) verbs are designed to operate with atomic data within context of a database transaction. REST is designed around the atomic transfer of a more complex state and can be viewed as a mechanism for transferring structured information from one application to another. HTTP separates notions of a web server and a web browser. This allows the implementation of each to vary from the other based on the client/server principle. When being used RESTfully, HTTP is stateless. Each message contains all information necessary to understand the request. As a result, neither the client nor the server needs to remember any communication-state between messages. Any state retained by the server must be modeled as a resource. You should read Oracle Documentation for more knowledge about REST. This section will show you how to overwrite the default providers in eXo JAX-RS implementation. There is set of providers embedded in eXo JAX-RS implementation. Implementations of MessageBodyReader and MessageBodyWriters are taking care about serialization/deserialization of message body (HTTP request/response’s body). The next set of media and Java types are processed automatically, thanks to embedded Readers (Writers). Object with simple constructor + get/set methods; 2. Java Collection (java.uitl.List<T>, java.uitl.Set<T>, java.util.Map<String, T>, etc) where T as described in 1. In some cases, it may be required to use alternative provider for the same media and Java type, but such changes must not impact to any other services. Deploy your own RESTful service(s) by using the subclass of javax.ws.rs.core.Application (hereinafter Application). Your service does NOT NEED to implement the marker interface ResourceContainer and MUST NOT be configured as component of eXo Container. Instead, Application must be configured as component of eXo Container. If RESTful services or providers require some dependencies from eXo Container, Application should inject it by own constructor and then delegate to services or providers. As an alternative method, getClasses() may be used for delivering services/providers classes instead of instances. In this case, services/providers will work in the per-request mode and RESTful framework will take care about resolving dependencies. The following example shows how to use the Jackson JSON provider instead of embedding in the eXo RESTful framework. Create the subclass of javax.ws.rs.core.Application with code as bellow and add it to the eXo Container configuration. In this example, it is assumed that Resource1 is Java class that carries JAX-RS annotations and uses JSON. In this case, the RESTful framework will use JacksonJaxbJsonProvider for serializing/deserializing all messages to/from Resource1. But it will not impact other services. The RestServicesList service provides information about REST services deployed to the application server. Path - Path to the service. Regex - Service’s URL regular expression. FQN - The full qualified name of service’s class. The list can be provided in two formats: HTML and JSON. The class does not implement org.exoplatform.services.rest.resource.ResourceContainer and must never be bound to the RESTful framework by using eXoContainer. This service must work as per-request resource. To do this, perform a simple GET request to the RestServicesList link. To do this, add the “Accept:application/json” header to your GET request. In this section, the RESTful service is considered to be compatible with the JSR-311 specification. There are two ways to save a script in JCR. The first way is to save it at server startup time by using configuration.xml and the second way is to upload the script via HTTP. This way can be used for loading prepared scripts. To use this way, you need to configure org.exoplatform.services.jcr.ext.script.groovy.GroovyScript2RestLoaderPlugin. See the simple configuration example below. The first value-param sets JCR repository. The second value-param sets workspace. The third one sets JCR node where scripts from plugin will be stored. If the specified node does not exist, it will be created. The list of scripts is set by properties-params. Name of each properties-param will be used as node name for stored script. The autoload property deploys this script at startup time, and the path property sets the source of script to be loaded. In this example, the single script is loaded from the local file: /home/andrew/JcrGroovyTest.groovy. This is sample of HTTP requests. In this example, the script is loaded from the test.groovy file. This example imitates sending data with the HTML form (‘multipart/form-data’). The autoload parameter is optional. If the autoload parameter is set to “true” (autoload=true), the script will be instantiated and deployed immediately. You should keep one class per one Groovy file. This is the same for interface and its implementation. However, the Groovy parser is limited that does not have the Class parseClass(InputStream) or Collection parseClass(InputStream) type but only Class parseClass(InputStream) instead. As described in previous sections, GroovyScript2RestLoader can be configured to deploy the scripts automatically at server startup time. It can also be configured to detect if source code of a deployed script has changed and re-deploy it. Once again, it works on the scripts that have exo:autoload property set to “true”. In the example above, the JCR workspace “production” will be checked for autoload scripts. At once, this workspace will listen to changes in the script’s source code (jcr:data property). If GroovyScript2RestLoader is configured as described in the previous section, all “autoload” scripts will be deployed. In the first section, the script from /home/andrew/JcrGroovyTest.groovy is copied to the JCR node: /script/groovy/JcrGroovyTest.groovy - repository “repository” and workspace “production”. Similarly to Loading a script via HTTP, you can use curl commands to manage the script lifecycle. This does not change the current state. Now you are going to try a simple example of Groovy RESTfull service. There is one limitation to your Groovy script that you should use Java style code and decline to use dynamic types anywhere except in private methods and fields. Create a script with the following code and save it to your home directory: /home/andrew/JcrGroovyTest.groovy. At this time it should have exception, because the JCR node “/test” is not referenceable and has not UUID. You will fix it in next steps by adding the mixin mix:referenceable. eXo Web Service provides a framework to cross-domain AJAX. This section shows you how to use this framework. The XmlHttpRequest objects are bound by the same origin security policy of browsers, which prevents a page from accessing data from another server. This has put a serious limitation on the AJAX developers. That is, you can use XmlHttpRequests to make background calls to a server, but it has to be the same server that served up the current page. Visit http://www.mozilla.org/projects/security/components/same-origin.html for more details. But actually, writing client web applications that use this object can be tricky given restrictions imposed by web browsers on network connections across domains. So you need to find the way to bypass this limitation of AJAX. 2. ServerA contains a main page with dedicated client and server IFRAMEs (see below) and an HTML client page (client.html) referenced from the IFRAME client. This client page contains the dedicated script to push data for request into the IFRAME server. 3. ServerB contains remote service that wants to get access to and an HTML server page (server.html) referenced from the IFRAME server. This server page contains a dedicated script to push the requested data into the IFRAME client. 1. A browser requests the Start page from ServerA, so the Start page is retrieved from ServerA. 2. Create one IFRAME element (“client iframe”) in the Start page IFRAME and insert it in the document from ServerA (client.html). 3. In “client iframe”, create one IFRAME element (“server iframe”) and insert it in the document from ServerB (server.html). Documents (client.html and server.html) contain special script that can transfer data between iframes. 4. “Client iframe” transfers information about HTTP method and URL that you want to do cross-domain request to “server iframe”. 5. “Server iframe” does simple XmlHttpRequest to the service that you need (it can do that because it downloads from the same domain) and gets information from service. 6. “Server iframe” transfers data to “client iframe” and now you get information that you want. Place the client.html and xda.js files in ServerA. Place the server.html file in ServerB. Use this function (here it is bound to a button’s onclick event): <button onclick='test()'>test cross-domain</button>.